The latest newcomer from the French boatyard Garcia is an all-aluminium 86' sloop. Designed by P. Frutschi with the Jubert-Nivelt studio for the naval architecture. The Garcia 86 is a super-yacht with sails built according to modern rules governing trends. 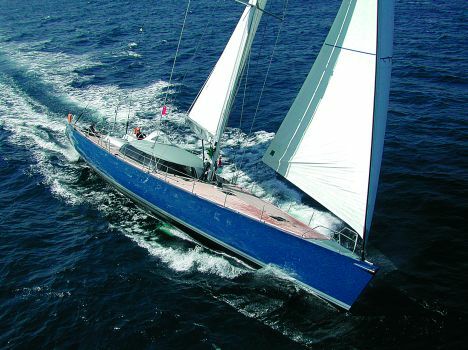 As a consequence teak has been used for the entire deck surface, the rigging is all assisted by new-generation equipment to enable sailing with a reduced number of crew members, and the combination of sail area and waterlines guarantees performance in line with the most recent regatta "maxis". The deck design is also fruit of careful study into the needs of modern owners. The transom is on the same level as the cockpit, thus creating a single roomy wheelhouse/sundeck area that means the crew can move about easily even during the most frenetic stages of the race, or that the ladies can sunbathe during cruises. Forwards of the command area, equipped with a double wheelhouse, there is a secondary cockpit fitted out with two long benches down the sides. The deckhouse has an original ellipsoid dome shape and houses a circular living area made up of a dinette to port and the plotting area to starboard. The galley, with peninsula, is located along a corridor to starboard, through which you reach the owner's suite in the bows, with its own private bathroom. Guests have at their disposal another two double cabins in the stern, both with their own bathrooms. Interiors stream with light, especially the central living area, which enjoys a large expanse of windows running almost completely around the perimeter of the deckhouse. The furniture has been chosen for its style qualities and the electronic accessories to ensure ideal comfort when cruising. For further information: Chantiers Navals Garcia; route de Vire; B.P. 64; 14110 Condé sur Noireau; France; tel. (33) 0231690392; fax (33) 0231690473; website www.garcia-bateaux.com; e mail garcia.bateaux@wanadoo.fr. Sail surface including Genoa: 386 sq/m.